If your presentation includes a PowerPoint slide, handouts, or any type of material that makes reference to or displays the work of others, be sure to follow the University’s Academic Integrity policy. 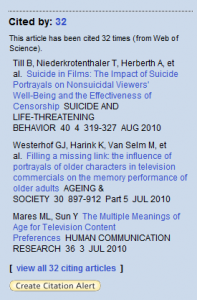 It is important to attribute the work of others, and APA citations may be appropriate. Cite all references to the work of others, and be sure to attribute all images and other media to their original authors. Please see the library’s guide to Academic Integrity for more information. We all know about APA rules for citing sources and creating a reference list, but it is important to remember that APA style also dictates the way you format and write your paper. If your senior project involves an academic style paper, be sure to format it according to APA style. Get familiar with the basics of APA style with their online tutorial. For the official rules, see the Publication Manual of the American Psychological Association. These resources will instruct you on formatting your margins, your title page, writing your abstract, and much more. For questions that are not covered in these guides, try searching the APA Style Blog, or contact me for help. If your project is being presented in some other format, such as a PowerPoint presentation, formatting rules are not likely to be covered by APA style rules. This is because the purpose of the Publication Manual is to assist scholars preparing their manuscripts for publication in journals. However, even in other formats, it is important to attribute the work of others, and APA citations may be appropriate. Cite all references to the work of others, and be sure to attribute all images and other media to their original creators. Please see the library’s guide to Academic Integrity for more information. As you gather background information on your topic and prepare your literature review, you will be doing a lot of library research and reviewing many, many articles. It is important to develop a good notetaking system, as well as a method for storing, summarizing, and retrieving articles you have already reviewed. Get Organized! Communication & Mass Media Complete, Communication Abstracts, and the Film & Television Literature Index, as well as many other useful databases are all available on the EBSCO platform, so you will probably find yourself using it often. You can create a personal log-in account to save article citations in organized and shared folders, and to save useful searches. It will also remember your complete search history if you log in at the beginning of each session. To create an account, click “Sign In” on the toolbar in the upper right-hand portion of the screen. You can use any log-in and password that you wish. After creating your account, you will still need to access the database through the library homepage. 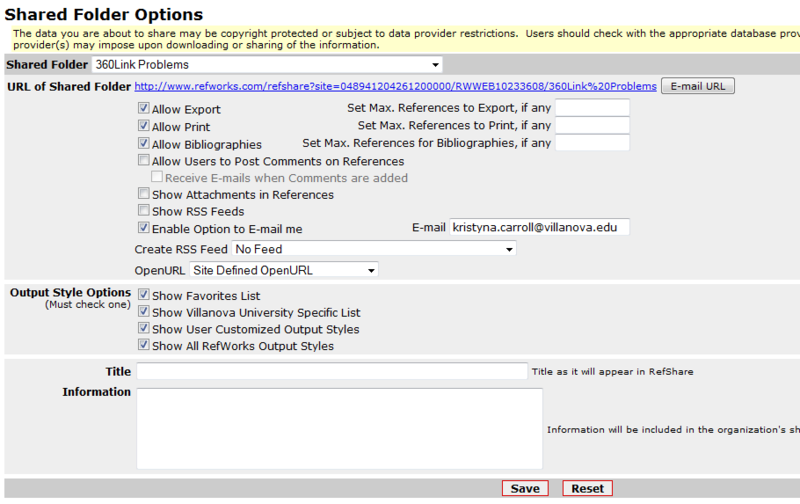 Refworks is a web-based citation manager. As you search through article databases, you can export citation information directly to Refworks. Citations can then be organized in folders and shared with group members. When the time comes to write your paper, the Write-n-Cite feature can automatically generate your in-text citations as well as your bibliography. Or, you can generate a bibliography of selected citations at any point. Always double-check for errors! Refworks has a tendency to capitalize incorrectly or improperly list author names. Always have your APA style guide handy. Refworks provides its users with a helpful series of online tutorials and is generally pretty simple to use. 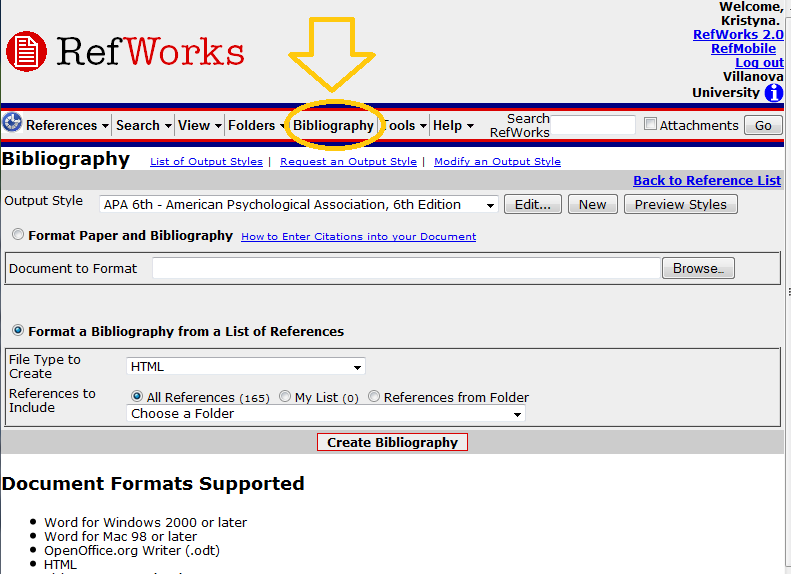 For more information, please see the library guide to Refworks, or contact me.